True, true, true. Many’s the time I’ve left my money in Las Vegas. Like Circe, the alluring witch of ancient mythology, the shimmering gambling palaces of Las Vegas can show you a good time and then turn you into a pig, or in this case, a pauper. You can see the city’s lights forty kilometers away, beckoning, in the arid Nevada desert. Indeed, you can see the lights of Las Vegas from space. Las Vegas is the American Dream run amok: capitalism on steroids, but it took a long time to get that way. In 1829, Spanish traders on the parched Mojave Desert trail from New Mexico to California had stumbled upon a patch of green in the desert, around a spring in Piute Indian territory. They called it Las Vegas: “the Meadows.” American explorer John C. Frémont, for whom Vegas’s main street would one day be named, passed by in 1844. But not a soul stayed put until eleven years later, when 30 Mormon missionaries built an adobe fort, planted fruit trees, and began scratching for lead in the surrounding mountains. Disheartened by incessant Indian raids, the Mormons departed in 1858, and nobody paid much attention to the isolated oasis until the railroad from Los Angeles reached the spot in 1904. Construction of Boulder Dam, one of the nation’s engineering marvels, to the south stirred up a ruckus in town in the 1930s, but Las Vegas remained little more than a gaudy diversion on the long haul between Salt Lake City, Utah, and Los Angeles. In 1940, eight thousand people and uncounted desert creatures endured life there under the baking summer sun. 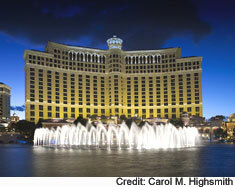 Like the Mirage Resort’s faux volcano today – and isn’t all of Las Vegas a mirage? – there were low rumblings that Las Vegas was about to explode with new development. But the nation was girding for war, and it certainly didn’t occur to anyone to set up a time-lapse camera on Fremont Street or on the two roads heading south out of town. One snaked down to Boulder Dam. 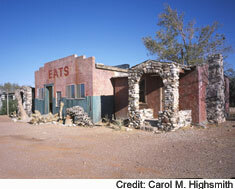 The other, Route 91, known as the Los Angeles Highway, knifed into the inhospitable desert. 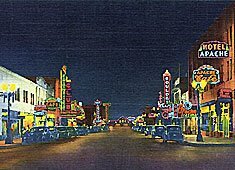 Even its first five-kilometer stretch outside city limits – which would one day sprout into today’s jaw-dropping Las Vegas Strip of super-sized gambling resorts – was just a two-lane road, unlighted, unremarkable, lined with sagebrush, a few billboards, and a couple of gas stations. All that glowed in the chocolate-brown hills between the two dusty highways were the lights of a grimy little government town alongside magnesium and titanium deposits that workers would soon turn into fighter jets. 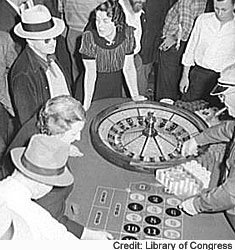 Nevada had legalized gambling in 1931, but the heart of the gaming industry was up north in Reno, at swanky clubs around Lake Tahoe. 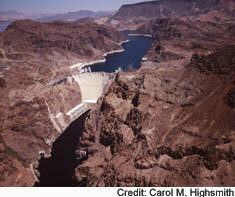 Las Vegas would have been nothing but that tawdry truck stop had not Boulder Dam – later to be called Hoover Dam in honor of engineer-president Herbert Hoover who authorized it – brought water, and really, really cheap electricity to power gleaming casinos that would light up the desert. Enter mob figure Bugsy Siegel, who bought some land and built the first one-stop casino, hotel, and high-class nightclub resort – the Flamingo – on that forlorn highway outside of town. 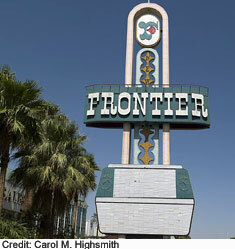 Elvis Presley first played Las Vegas at the Frontier Hotel (he bombed). This is actually the “New” Frontier, which was imploded last year. Imagine how the old one looked! The eruption had begun. All kinds of other desert-themed resorts – the Sahara, the Dunes, the Sands, the Aladdin – soon followed. It was as if a make-believe Lawrence of Arabia had moved operations to the American Southwest. Before long, Caesars Palace, the MGM Grand, and other high-class casino haciendas enticed patrons not just with plush furnishings and a workforce dressed like Roman centurions, but also with headliner shows, championship boxing, and offbeat events. It was in Vegas, for instance, that daredevil Evil Knievel nearly died on New Year’s Eve, 1967, when he crashed his motorcycle after soaring over Caesars’ fountain. We could have rolled that time-lapse film ahead to the early 1990s, when, to keep up with other burgeoning entertainment centers like Orlando, Florida, and gambling retreats abroad, Vegas began retooling with mind-boggling gusto and extravagance. Down went the Dunes Resort first, blown to smithereens by a demolition team. And up, over time, went the Bellagio, a virtual city unto itself with 3,933 rooms, multiple pools, botanical gardens, a shopping arcade fit for the Riviera, and dancing fountains whose water-and-light show stops tourists dead in their tracks. Quite a change, all in all, from the Dunes’s meager electronic lava eruption on its marquee. Spool ahead to the 1990s, by which time more than 1.5 million people lived in Las Vegas and the surrounding valley. 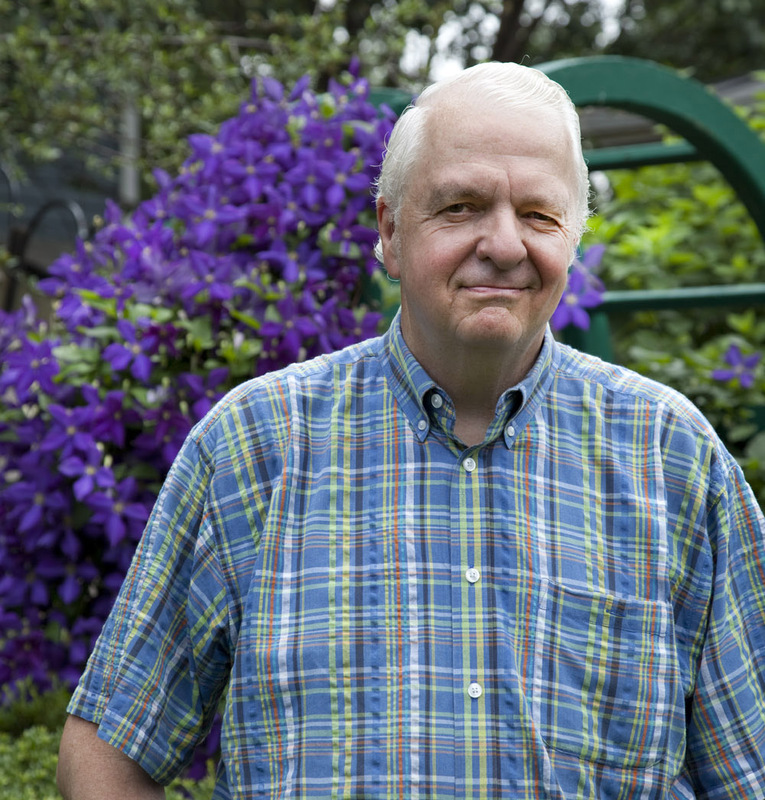 The metropolitan area’s astonishing 83-percent growth rate that decade led the nation. Suburban Henderson grew so fast that people called it “Boomberg, U.S.A.” More than tripling in size to 205,000 in a decade, Henderson replaced Reno as Nevada’s second-largest city. Fueling the explosion, in addition to the hypnotic appeal of all its ostentation, were the surfeit of high-paid jobs, the tsunami of disposable dollars dropped each year by 35 million visitors – 35,000,002 counting Carol and me – and the absence of a state income tax. Hold that Card. Let Us Pray. Pretty soon unincorporated Las Vegas, on the Strip, sucked up all the action, save for the beer-and-bluejeans crowd that to this day prefers to gamble in the more affordable places downtown. There, you still see some of the seedy motels that were once inelegant quarters for tourists heading to Hoover Dam. Many offer monthly rates for the down-and-out, or they’re boarded-up placeholders for the day when the big time comes to Old Town. 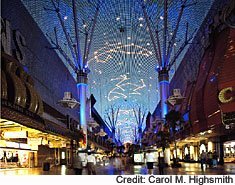 In 1996, Downtown Vegas did get a $1-billion facelift with the creation of a canopy of 12 million colored lights and 218 enormous speakers arrayed above four blocks of Fremont Street, which had been covered and enclosed. Twelve million lights? That’s the claim! The “Fremont Street Experience” erupts in a Cecil B. De Mille-scale, computer-generated sound and light show that Vegas Vic, the rascally, winking neon legend looking on from the nearby Pioneer Club, must have a hard time comprehending. At about this time, Vegas attempted an odd metamorphosis when it tried to pass itself off as a family destination. This was laughable, and it failed abjectly. There just wasn’t enough for the kiddies to do. Though they wouldn’t admit it, their parents far preferred to pull slot-machine handles, not take Junior on the Ferris Wheel. Exit the family-friendly promotional campaign. Enter “What Happens in Vegas Stays in Vegas,” with its vague, naughty overtones. 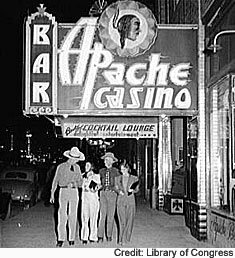 Out, too, went most of the low-rent cactus and desert themes, as well as blocks of worn-out trailer parks and cinder-block apartment buildings, bulldozed to make room for more megalith escapist casinos. One, New York New York, was packaged as a scaled-down, but quite believable-looking, version of the Manhattan Skyline. Another, the Luxor, was assembled inside a giant pyramid. Others suggested Venice canals and Paris’s Eiffel Tower. 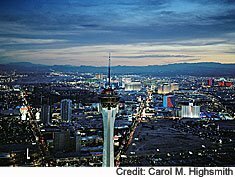 Las Vegas had unimaginably become more than a string of what Vegas regulars call “carpet joints.” It was, to use tourism parlance, the nation’s ultimate tourism “destination.” At the turn of the 21st Century, Las Vegas boasted all ten of the largest hotels in America, and 14 of the top 15. 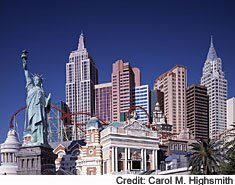 For the first time ever in Sin City, non-gaming activities brought in more revenue than gambling. Today, words can hardly describe the megawattage of the City of Lights – not to be confused with Paris, the City of Light. 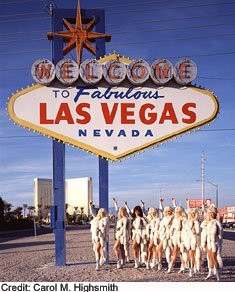 The local electric company once estimated that the juice needed to illuminate Vegas’s outdoor signs alone would electrify a city of 25,000. 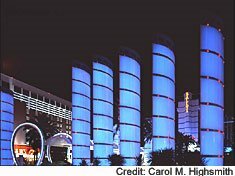 During the summer of 2001, when Los Angeles, across the desert far to the west, was battling brownouts, Las Vegas burghers scoffed at any notion of dimming its lights, even late at night, to help the power grid. Vegas without garish lights, they snorted, would be like Bali without the sea. The cumulative effect of pulsating neon, frenetic billboards, the Luxor “pyramid’s” laser beam pointed heavenward, downtown Vegas’s indoor light show, and the racket from slot and video-poker machines – an estimated one per eight residents in the Valley – is an aura that some consider to be perpetual excitement. I call it jitteriness. Vegas unnerves me, makes me wary, rather than inducing me to gamble. But that’s me. Others, moths lured by the light, itch for the action. And of course, there’s a third group: sad alcoholics and disheveled, desperate gambling addicts downtown, not on the Strip, so much; they can’t afford to play blackjack at tables where the minimum bet is $10, or afford too much time on the slots at $1 a pull. This is all a far cry from the days I remember, when you’d buy a bucket of quarters and pull that handle, watch the spinning cherries and lemons and circus clowns, and sip on the complimentary beer or watery bar-brand drinks until boredom sets in. If bloodshot eyes and a vacant stare and the nebulous hope of a jackpot qualified as fun, those were great good times. I well remember my first trip to Vegas, 40 years ago, in which my first wife, an impetuous Taurus, and I, a frugal Virgo, resolved and double-resolved that we would allot $500, and not a penny more, to lose at the tables and the slots. Losing was a foregone conclusion. We rationalized were paying for the entertainment of it all. When the $500 was gone, we would go window shopping, straggle back to the room and watch television, or do anything else we could think of that cost nothing. But inexorably, $500 dwindled and disappeared, and true to our vow, we called it a night. It was about 2 a.m., not that you’d know, since it’s quite true that the only clocks you’ll find in Vegas are on the radios in your room. My wife went to sleep. I tossed. I turned. I fidgeted. And I popped out of bed and slunk back down the casino. There, I promptly drew another $500 using our credit card, and, among the handful of zombies playing at that hour, lost every bit of that, too. My wife’s reaction? I believe I mentioned that she’s an ex! My second-to-last visit, this time with Carol, “weirded me out.” It was late autumn, 2001, a couple of months after the terrorist attacks on Washington and New York City. Gamblers, especially the high rollers who think nothing of hopping into their private jets and flying to Vegas from Hong Kong or elsewhere for a weekend of shows and gaming, were nowhere to be found. Skittish at rumors that Las Vegas, the very symbol of capitalist excess, would be the next target of madmen, they were elsewhere, and so were thousands of ordinary tourists. We saw precious few tour buses. 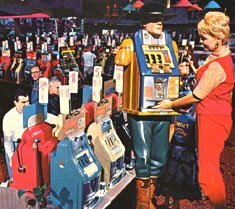 There were no lines at the buffet, and there wasn’t much clatter in the slots parlors. I am not exaggerating to report that a couple of late evenings Carol and I walked down the middle of Las Vegas Boulevard in front of the fancy resorts with only an occasional passing taxicab to dodge. It was on that visit that we met and spent some enchanting time with three Las Vegas legends: superstar singer (and writer of 500 hit songs) Paul Anka, as well as Siegfried and Roy, the illusionist “masters of the impossible” who made tragic headlines two years later when Roy was attacked and nearly killed during their famed animal act by a tiger who was apparently spooked by a loud noise. Carol had stood alongside that tiger, and a dozen others, onstage with Siegfried and Roy for an unforgettable photo shoot. And we have a few other indelible Vegas memories: We were buzzed back and forth in a helicopter so that Carol could photograph just a whisker above the blitz of lights on the Strip. 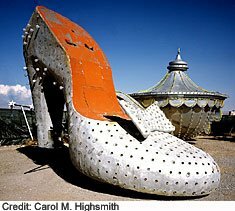 We poked through eclectic attractions like the Elvis-a-Rama Museum and the Neon Boneyard. In the latter, vintage neon and incandescent signs – such as the lightbulb-emblazoned marquee of Binion’s Horseshoe casino, or the silver slipper from the casino of the same name – languish until some of them are rehabilitated. are tourists. 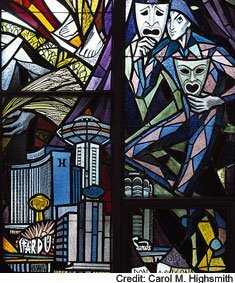 The building – a church, mind you – has a lovely stained-glass window that mixes holy themes with secular depictions, including images of Vegas’s casinos. Casino images in a stained-glass church window! Only in Las Vegas! We checked out the Casino Legends museum at the Tropicana Hotel, which displays 20,000 Vegas keepsakes, from marked cards and weighted dice to showgirl costumes and old-timey mechanical slot machines – emphasis on mechanical, from the days when complex gears and wheels, not electronic circuitry, gobbled up your quarters and Kennedy half-dollars and made the images whirl. Those were the days when silken-voiced crooners Frank Sinatra, Dean Martin, Sammy Davis Jr., and two other of their -drinking buddies, would cruise the clubs after Sinatra’s shows at the Sands; and the days when you could get a decent 99-cent, all-you-can-eat breakfast any time of the day or night. Many a hard-up alkie gambler lived on these spreads. These were the times, too, when Don Rickles, who would insult his dying mother for a laugh, was as risqué as a comic would get; and the showgirls, while voluptuous, were “showing” mostly sequins and shapely legs. You may have noticed that I haven’t mentioned the glamorous settings you may have seen in an “Oceans Thirteen” or James Bond movie set in Las Vegas. That’s because if I said that Vegas unnerves me, it goes triple when it comes to games like craps, where you need a babe in ermine draped over one arm while you fling the dice with another; or baccarat, an exotic game off-limits to the rabble, which I couldn’t play even if I knew the rules because my tuxedo doesn’t fit any more. Boomberg, U.S.A. is somewhere else right now. 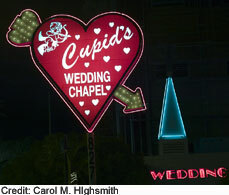 Despite its reputation as the world’s wedding capital, Las Vegas ranks second with about 115,000 performed each year. Istanbul, Turkey, is first. Who would have known? But I’m thinking you can still get the wedding where “Elvis” walks the bride down the aisle and sings for fifteen minutes over a karaoke track after the ceremony. Cacophony. This means a harsh or discordant note or interruption. But more broadly it has also come to refer to a really loud and disruptive clatter, as when reporters shouting questions, all at once, at a defendant emerging from a trial. Smithereens. This is a fun word to say. But where exactly do you end up when you get blasted to smithereens? “Smidder” was an old Irish word for a bit or a fragment. Perhaps an Englishman named Smith dropped a glass goblet, and it smashed to smithereens. Sodom and Gomorrah. These were cities on the Jordan River that, according to the book of Genesis in the Bible, were destroyed by God, who rained down fire and brimstone to punish their inhabitants for their sinful, lascivious ways. The two cities are often lumped into one place when speaking of a “Sin City” of today.